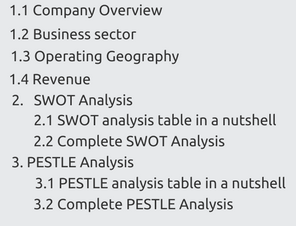 The SWOT Analysis for W.W.Grainger is presented below. 1. E-commerce leadership: W.W. Grainger is 11th largest retailer in North America as ecommerce retailer. The company started its e-commerce service in 1996 and it was the first commerce-enabled website in the industry. Out of total sales, more than 65% of the sales are channeled through its digital network which contributes to 57% of revenue generation from the USA. Grainger had more than 38 million online visitors in 2016 and its increasing day by day. Grainger focused on ease of searching for customers and created “search-and- select’ process with approximately 1.9 SKU’s available online in the USA. Grainger had created keepstock inventory management system and eprocurement system which will drive complex needs of large customers. Its MonotaRO 2000 and Zoro 2010 are online only businesses for small customers. The company uses its digital solutions to build a relationship. The company leverages digital marketing to boost the sales growth. E-commerce market is increasing worldwide and leveraging its stronghold would benefit the company in the long run. 2. Strong balance sheet and cash flow generation: W.W. Grainger has strong financial records with a current ratio (ratio of current assets to current liabilities) is 2:1 for last 3 years. This shows that W.W. Grainger is utilizing their financial capacity at optimum possible level. Cash flow statement of the company shows $1 billion income from operating activities which company is investing for future growth of the business. W.W. Grainger had generated free cash of $774 Million in 2016 which indicates the strength and ability of the company to generate cash. The strong cash flow equips Grainger with flexibility and liquidity for funding working capital needs and long-term cash requirement. Grainger used these strong cash flows for share repurchase and distributed the profit to shareholders by paying dividends. Grainger have continuously increased dividend pay-outs each year for last four decades and stands among 3% of S&P companies who does that. 3. Strong supply chain management: W.W. Grainger has world-class supply chain management. Grainger invested heavily in logistics facility and developing Distribution centre network. This robust and evolving Distribution centre network allows Grainger to manage 700000 stocked SKU’s (Stock keeping unit) in the USA. To increase the speed at which product move through supply chain Grainger continuously evaluates its 3000 key product suppliers and make them reliable to cater to expected service. They offer 99% same day delivery facility for in-stock items. The company provides 24 hours customer service with just a phone call. In 2015, Grainger focused on product procurement optimization through which they achieved right supplier mix to serve the customer. The company caters to their customers with the help of multichannel facility, specifically targeting high touch channel and also single channel online mode. Business has shifted from a traditional mode of visiting branch, telephones to the digital order by online and onsite platform, Grainger has anticipated and evolved its supply chain to accommodate these changes. 85% of the Grainger’s order were directly shipped to the customer or made available through onsite services. Grainger focuses on $127 billion MRO products markets in the US as of 2017, of which it has an estimated 6% market share. Thus a strong an efficient supply chain is critical for it to grow further and strengthen its business. This section is available only in the ‘Complete Report’ on purchase. The PESTLE Analysis for W.W.Grainger is presented below. 1. Requirement of skilled labors: Changes in technological and environmental trends changes requirement of the skillset of labor. Increasing demand for specific skillsets will increase wages of skilled labor, thus increasing operating cost of the industry. Automation and digital shift demand tech-savvy staff along with adaptable employees. Grainger needs to focus more on training its employees in niche skills to maintain its competitive advantage in the industry. 2. Workplace Friendliness: Millennial wants to grow professionally keeping their lifestyle intact and improve. They want to advance in their career but also gave critical importance to lifestyle improvement. Today, people would prefer to work for an organization which has great culture of inclusiveness and team working spirit. Grainger received “The women’s choice award” and named in best companies to work for millennials in 2018.This shows that Grainger’s culture is inclusive and aligned to Millennia’s interest to work for. 3. Digitalization fuelling e-commerce: Digitalization provides right choice, right price and easy buying for the customer. This enhances the e-commerce experience of the customer and hence digitalization becomes the driver of e-commerce growth story. Grainger is set to leverage its e-commerce leadership for future growth of the company. The company is actively involved in updating their website and improving on ease of searching and purchasing behaviour of the customer. Grainger is going beyond the general search criteria like brand, price, category and moving into more specific criteria like strength, quality, temperature control etc. Customer welcomed these advancements which ease out selection and enhances customer experience over other competitors. Thus, digitalization is fuelling e-commerce and Grainger’s recent steps strengthen their position to take advantage over others. 1. Development in Automation: Development in the application of robotics and automation systems increased efficiency in industrial supplies industry. The overall efficiency of MRO industry is also improved due to preventive maintenance, predictive operational repair, and maintenance. Increasing use of automation in supply chain reduces the errors due to human intervention and helped in creating an optimum supply chain with minimum cost. This agile logistic and supply chain facilitated the opportunity for manufacturing to embrace cost-effectiveness to add value to the bottom line. Grainger has used automation in creating optimum inventory management system which makes controlling easy and accurate. By adopting automation Grainger made itself competitive in the industry with reduced cost of operations. 2. Increasing use of digital platform: Development of digital platforms for ordering industrial products made a significant shift in the industry. Increasing use of digital platform reduces operational cost in the industry by allowing suppliers to maintain only digital platform and warehouses instead of hundreds of outlets and distribution network. Grainger has adopted this change and made significant effort to evolve itself as a digital platform for ordering industrial supplies. Company’s 65% sale comes through this platform which signifies the advancement in digital ordering trend. Arrow Electronics, Fastenal Company, McMaster-Carr Supply, MSC Industrial Direct, Systemax. 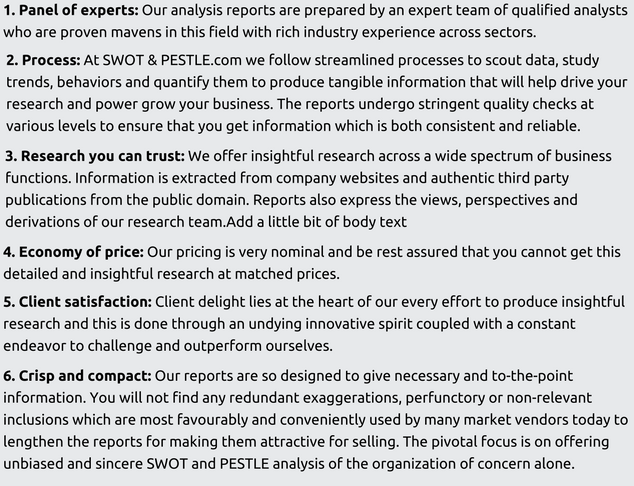 W.W.Grainger SWOT and PESTLE analysis has been conducted by Aditya Limaye and reviewed by senior analysts from Barakaat Consulting. 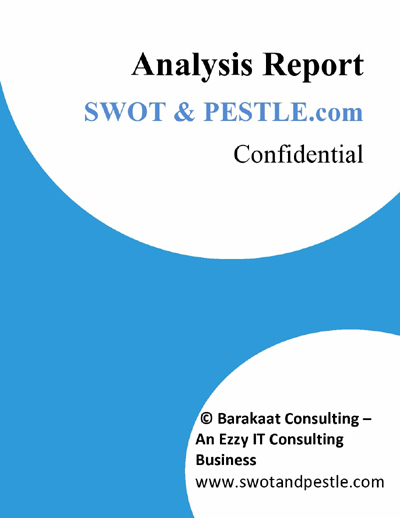 Copyright of W.W.Grainger SWOT and PESTLE Analysis is the property of Barakaat Consulting. Please refer to the Terms and Conditions and Disclaimer for usage guidelines.